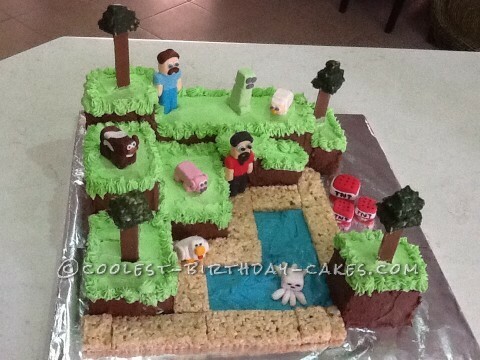 For this Minecraft cake I baked a double mix of home made chocolate cake and baked it in a large roasting size tin. I made up some templates with paper cut outs to ensure I used the whole cake in the making. I made all the characters out of pliable fondant icing which I coloured with gel colours. I Cut the cake into shapes so you get different heights when stacked. Use some butter icing to stick the layers together. I iced the blocks with chocolate icing on the sides and green icing on the top. I then used a piping bag around the edges to create a grass look. The sand is LCM bars cut in half long ways and the water is blue butter icing. The trees are layered LCM bars painted green and the tree trunks are Kit Kat bars. I used tooth picks to anchor them and join them together.